Filed under higher-educationpersonal on September 20, 2014. One of the things about a promotion, is the promotion! 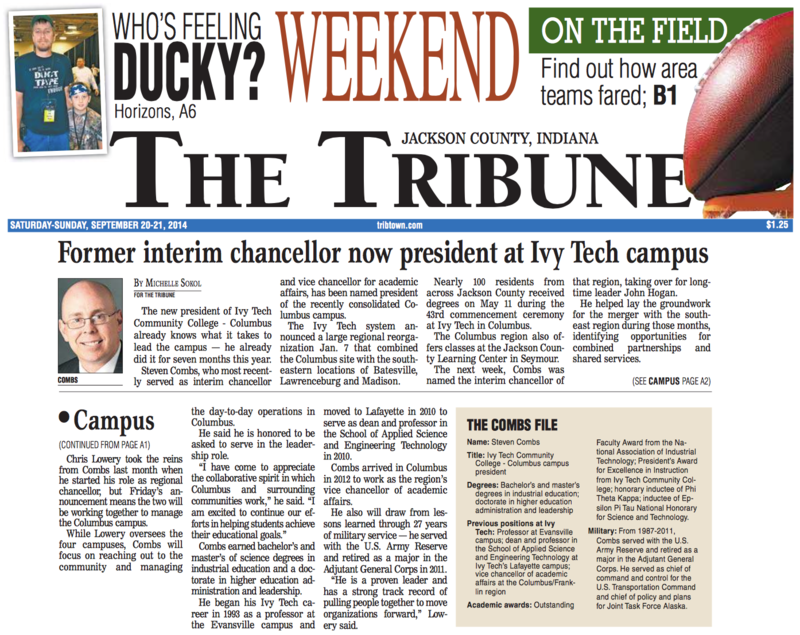 As is evident in the content below, on September 19, 2014 I was appointed as the Ivy Tech Community College – Columbus campus president. A press release, found at the bottom of this page, was submitted that same day and it didn’t take long for the news to spread. Admittedly, I also helped spread the news on my Facebook, LinkedIn, and Google+ pages. There was an outpouring of congratulations from friends, family, colleagues and community leaders. I can’t thank them enough for their support and confidence. I’ve served as the interim chancellor, for the old Columbus/Franklin region, for the past seven months. As the college reorganized, they were in need of a campus president to continue to engage the community, ensure efficient campus operations and serve as the chief customer service officer. As the vice chancellor for academic affairs, these were not an expectation; however, during the past seven months, I began to enjoy these aspects of my interim chancellor role. I am glad to have the opportunity to continue this work in the newly created campus president’s position and to serve our newly appointed regional chancellor. More exciting is that I will not only serve the city of Columbus, but I also have responsibility for the communities of Scottsburg, North Vernon, Seymour, Greensburg and Nashville. In my interim role, I began to learn much about each of these unique communities. Each comes with differing cultures, challenges and opportunities and it is these unique community qualities that excite me. Since becoming a dean at our Lafayette campus four years ago, I have enjoyed bringing teams together and to work with community leaders to expand educational opportunities. I am pleased and humbled that the college has selected me to continue this work. 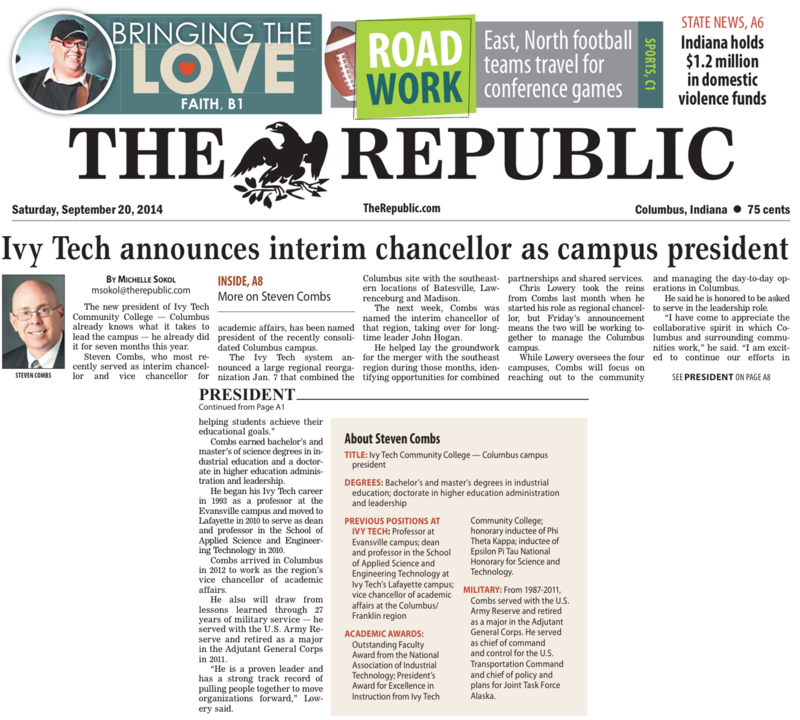 The Inside Indiana Business post was a repost of our college press release. You can view the post by clicking here. The Republic is our local paper and our education reporter, Michelle Sokol, does an amazing job. I was impressed at her take on the blanket press release. A duplicate of The Republic article above with a bit different take on the sidebar. Columbus, Ind. 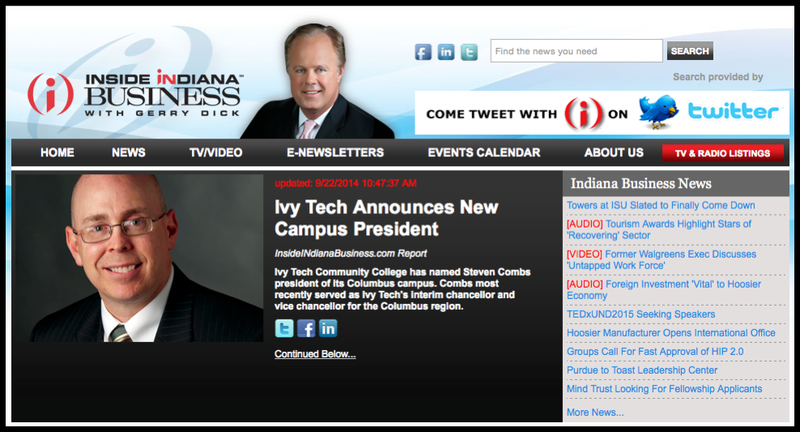 – Ivy Tech Community College has selected Steven Combs, Ph.D., as Columbus campus president. Combs most recently served as interim chancellor and vice chancellor for Academic Affairs for the community college’s Columbus region. Combs will report to the regional chancellor, Chris R. Lowery. The focus of the local campus president will be outreach to the local community. In addition, campus presidents will manage the day-to-day operations while fostering a campus climate that is consistent with the College’s core values. The campus president consults with regional administrators to achieve policy objectives and goals for building new and varied community outreach and partnerships, as well as expanding the availability of the College’s instructional and student support services to the community. In 1993, Combs began his Ivy Tech career in 1993 as a professor at the Evansville campus. In 2010, he was hired as dean and professor in the School of Applied Science and Engineering Technology at Ivy Tech’s Lafayette campus. He then came to Columbus in 2012 to serve as the region’s vice chancellor of Academic Affairs. Combs holds Bachelor and Master of Science degrees in industrial education and a doctorate in higher education administration and leadership. His field of expertise is technology, including advanced manufacturing, industrial technology, mechanical design technology, robotics, web programming, computer-aided design, and technical graphics. From 1987 until 2011, he served with the United States Army Reserve and retired as a Major in the Adjutant General Corps. He served as Chief of Command and Control for the United States Transportation Command and Chief of Policy and Plans for Joint Task Force Alaska. During his academic career, he has been the recipient of the Outstanding Faculty Award, given by the National Association of Industrial Technology, and the President’s Award for Excellence in Instruction, given by Ivy Tech Community College. He is an honorary inductee of Phi Theta Kappa, the largest honor society in higher education serving two-year colleges offering associate degree programs, and an inductee into Epsilon Pi Tau National Honorary for Science and Technology. Dr. Combs has written 14 textbooks and workbooks and has given numerous presentations for international associations, conferences, and college and university symposia. “Steven has the skills necessary to lead our operations in Columbus and the surrounding communities of Greensburg, Seymour, Nashville, North Vernon, and Scottsburg.” Lowery said. “He is a proven leader and has a strong track record of pulling people together to move organizations forward.” A graduate of Leadership Lafayette, Combs is a member of Columbus Sunrise Rotary, Columbus Economic Development Board, Columbus Education Coalition, Reserve Officer’s Association, and Association of the Century. Combs resides in Columbus with his wife Nikki A. Combs, who is an adjunct psychology faculty member at Ivy Tech Community College and IUPUC.